Telescopic Extendable Replacement Head Angled Cobweb Brush with Pole. 180 Degree Swivel Lockable Joints can be angled so doorframes, cupboard tops or around outside porches can be reached and brushed effectively. Soft and Plastic Cobweb Feather Duster Bristle Brush to flick out dirt. With extendable telescopic handle 103 to 152cm, the joints can be locked for different cleaning angles. Enables the use of different cleaning devices. Special shape for efficient cleaning of corners. Ideal for dusting beams, high ceilings and stairs. 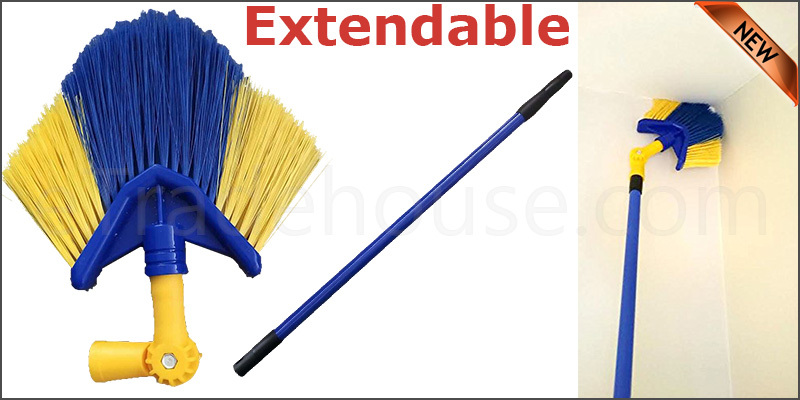 This Cobweb Brush enables one to work at ceiling height and to the eaves on some houses without the need of a ladder. After using the brush, the bristles can be washed under running water to remove all remains between the bristles.